:: Happy 1st Birthday Mr. Jackson!!! :: Happy 1st Birthday Jackson! Happy 1st Birthday Mr. Jackson!!! Happy 1st Birthday Mr. Jackson!!! It's "Heart Girl" or Erin...I just wanted to say I had the personal pleasure of meeting this sweetheart Angel and I really hope everyone prays really hard for Jackson and his family on this day, and everyday!! Happy Birthday Jackson. I wish your family and friends well and I am always praying for you. Have a wonderful 1st Birthday Jackson! Enjoy your day with all your angel friends! Prayers for your family. We will certainately being thinking of you and your family this week. In honor of Jackson's birthday me and my boys will send him some balloons to heaven. I can only imagine how difficult this is for you, Jackson is so very lucky to have such a special person in his life who cares so much about him and his family. Thanks for letting us know about the birthday! Hoping all the Angels are celebrating big time with you. Birthdays are hard down here, without you. Wishing gentle memories for your family. We often think of Jackson, and how he touched our lives. Although we were not able to meet him, he taught us so much! We now celebrate his life, and the many lives that he touched! Jackson, may you soar proudly with the angels today! Sara, Jake, and Molly-I am certain that Jackson's birthday is going to be a hard day for all of you....please know that you are in our thoughts and prayers, today, and every day! You are blessed to have 2 wonderful and precious angels, one in heaven and one on Earth. May you have comfort in knowing that Jackson is always by your side, that he is free from pain, and that he was blessed with a wonderful, loving, and caring family. Happy Birthday to Jackson! What a party they must be having in the heavens! The kids and I will send balloons up tomorrow, with special messages on them. Sara, Jake & Molly-our thoughts and prayers are with you on a day that is both sweet with cherished memories and a painful at the same time. Happy Birthday Jackson!!! Your life has touched many!!! I just want you all to know that I am thinking of you and praying for you everyday. Happy Birthday, little one. Have fun in Heaven with all of your angel buddies!!! Jake, Sara and Molly, we're thinking of you today. We love you! Happy 1st Birthday Jackson!!! Dan and I planted a tree today to honor you on your special day!!! Hope they have a great party in heaven for you today. Miss you little one. Thinking of you all on Jackson's special day. I just sent you some balloons, they will be up there shortly! Hope you have having a great party in heaven today. The balloons might have some leaves with them, when the wind first grabbed them, they ended up in a tree! Oops! The wind got them loose though, so they are on their way. I hope today goes ok for you, that you are able to celebrate Jackson's birthday even with the sorrow that must be especially present today. Today, we will celebrate a life that has touched the hearts of so many. Thinking of you today and always. Just wanted you to know that we are still keeping your family in our prayers. Hope today is full of the good memories and that the love of God fills the emptiness. I hope today fills your hearts with warm thoughts and memories of your special little angel--he truly was special and touched the lives and hearts of many people. Jackson will never be forgotten-I think of him often and always wish things would have been different, but reality is, it wasn't. I continue to pray for all of you because I am sure there are stiil many hard days and always will be. Happy Birthday Jackson!! Thinking of you all today & always, thinking of our (your) Little Angel, Baby Jack. I know he is in Heaven entertaining all the other Angels, relatives and friends that have gone before us. Showing them all what little 9 month olds can do and I wonder what the Lord thinks of all his little antics (some can be very humerous). You are not alone, we are all here for you at all times. Jake, Sara & Molly you are always in my prayer along w/your Little Angel. God will be w/you in all your needs. You are always in my thoughts, and would you know a butterfly flew beautifully near Adam the other day, and instantly I thought of you!! Much hugs to Mom and Dad and little Molly. Please send me an e-mail. 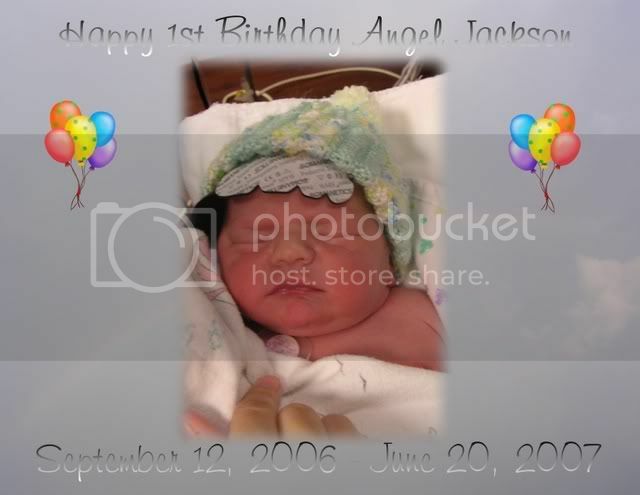 Happy 1st birthday angel jackson. God bless the family and live on with the god memories. Happy Birthday in Heaven Sweet Jackson. I hope/pray that the day was as gentle as it could be with sweet memories of Jackson's most precious life. Thinking of your entire family. Happy Birthday precious Jackson! I hope today has been one filled with memories of Jackson. I know this comment is pretty late, but I havent been on here in a while. But, HAPPY 1ST BIRTHDAY JACKSON! I'm sure up in heaven you've learned SO many new things, and I wish i could see it right now. Eventually I'll be up there with you.